ZigBee protocol provides low-cost, low power solution for remotely controlling and monitoring smart equipments, fleet applications, home automation systems, medical devices and other compliant systems. It is used by leading manufacturers of semiconductor devices, technology firms, wireless communication devices as the de-facto communication protocol. In this article, we’re going to share some basics about what exactly is zigbee protocol, what are its applications and why is it the favorite communication standard of smart home manufacturers around the world. The ZigBee wireless technology is basically a openly available global standard to address the uniques needs of low-power, low-cost wireless M2M(machine-to-machine) networks and also Internet-of-Things(IoT). It operates on IEEE 802.15.4 physical radio specification and operates even in unlicensed band including 2.4 GHz, 900 MHz and 868 MHz. In 2003, the 802.15.4 specification on which the ZigBee stack operates got an official approval and recognition from the Institute of Electrical and Electronics Engineers (IEEE). This specification is a packet-based radio protocol that is intended for the low-cost, battery-operated devices. This protocol offers devices to have battery life lasting for years and also allows them to communicate in a variety of network topologies. The ZigBee protocol operates globally on a single frequency of 2.4 GHz. ZigBee offers wireless range of 70m indoors and and 400m outdoors. It offers networking flexibility to covers homes of all size by offering support for multiple networks like point-to-point, point-to-multipoint mesh-networks. Low latency and Low Duty cycle leads to lower power consumption giving sensors the long-lasting battery life for up to 7 years. Direct Sequence Spread Spectrum (DSSS) helps to offer higher data rate for quicker responses. Caters to thousands of devices for spread networks. ZigBee uses AES 128 encryption (government, commercial and military grade encryption used across the Internet) thus protecting your information over the air transfers. ZigBee can easily integrate monitoring and control of lights systems, security systems, convenience and motion detection. The mesh-network operability of ZigBee reduces the chances of failure at nodes and the ad-hoc routing offers greater stability. Because of its three major USPs of being low-cost, low-power consumption and having faster wireless connectivity, the ZigBee protocol caters to a lot of applications like industrial automation, home automation, smart metering, smart grids etc. Also with it low-power requirements, it ensures seamless operation of various sensor equipments offering years of battery-life. Here are some of the areas where ZigBee is widely used. Industrial Automation: ZigBee offers a faster and low-cost communication that can communicate with almost all devices in factories and centralise them at one place making it easy for you to monitor every process and thereby optimise the control process. ZigBee protocol also finds its presence in many medical and scientific equipments such as personal chronic monitoring, sports and fitness trackers, and can even be used for remote patient monitoring. Smart Metering and Smart Grid Monitoring: In case of smart metering, ZigBee is used for better energy consumption response, security over power theft, pricing support etc. Additionally in case of smart grids, ZigBee is even used for reactive power management, fault locations, remote temperature monitoring, etc. 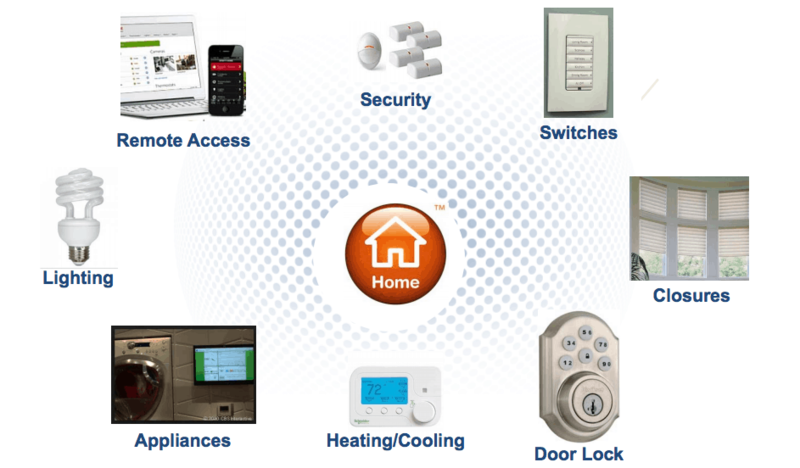 Home Automation: ZigBee is one of the most widely used protocol in most of the home automation equipments. Right from offering lighting system solutions, sensor responsive solutions to security solutions and surveillance, ZigBee has its presence everywhere. ZigBee protocol is widely used for home automation solutions and caters to complete holistic solutions of lighting control, security control, comfort control and even energy management. There are several well-known globals brands in home automation that use ZigBee for their devices. Since Zigbee is cross-compatible and interoperable, it makes managing multi-vendor devices easy and simple. If a device is ZigBee Home Automation (HA 2.1) compliant, you can be rest assured that it will work with your automation system, irrespective of the vendor. The mesh-routing network of ZigBee wherein one device can talk to multiple device and data packets travel on no fixed routes, offers better flexibility and faster communication across devices. Built in security with interference avoidance techniques ensures better/enhanced security and worry-free operations. Help you customise lighting scenes based on daily schedules, events and activities. Due to low-power consumption of the ZigBee protocol, your security sensors can work for a period of 7 years. The use of ZigBee is free for to the general public i.e. for non-commercial purposes is absolutely free. ZigBee Co-ordinator (ZC): This is the most important device as it forms the root of the network tree and helps to bridge to other networks. This means that you will find one ZigBee coordinator in each network as this is the device responsible for the start of the network. This device contains all the information of the network and functions as a Trust Center & repository for the security keys. ZigBee Router (ZR): In addition to running an application function, its is used to route the data from other devices and help it reach the destination. ZigBee End-Device (ZED): The end device contains just enough functionality to talk to either the co-ordinator or the router. Note that it cannot rely data from other devices. This causes the node to stay asleep for a significant time thereby increasing battery life to a considerable extent. A ZED device requires least amount of energy as compared to the ZC or ZR. Some of the very famous brands in home automation that has its line of products working on the ZigBee protocol are Samsung, Philips, OSRAM, Sonos, Belkin and a lot more. Let us take a look at some of the advantages you get while selecting ZigBee products. Wireless technology helps eliminate the hassle of dangling cords. One standard protocol spread across multiple products helps reduce the cost of products because of large number of players and competition. This also gives customers the ease to select between variety of products. Easy installation and maintenance reduce operation costs giving affordable solutions. Higher interoperability and cross compatibility among devices. Device Authentication and AES 128 ensures secured data transfers. Internet connection for greater control and access. Receive instant notifications upon detection of any unusual events. Caters to all sectors like lightings, security, appliances and home access. Better dispersal of data transfer reducing load at single point. Short time delay, typically 15 ms for standby to activation,15 ms for channel access of active devices and 30 ms for device searching.